“My experience with personal trainers had been the typical stereotype – a person who uses the same exercise routine for everyone, provides some basic nutritional information, and spends most of the training session looking around the gym instead of focusing on my workout. “Jeff goes way beyond this kind of simplicity. He emphasizes the total picture, including questionnaires, formulation of realistic goals, extensive and customized nutritional advice, and most important to me, enthusiastic support. Jeff’s knowledge of the human body, its functioning, and its biochemistry is truly amazing. For instance, how many trainers have discussed with you the difference between slow-twitch and fast-twitch muscle fibers, or the importance of the hormones insulin and glucagon to losing weight? “I am in the midst of a national ‘physique transformation’ contest sponsored by Experimental & Applied Sciences (EAS), a leading nutritional supplement company. Midway through the training program that Jeff put me on for this contest, a friend of mine actually accused me of having resorted to liposuction because my progress was so rapid! “Because of this, we decided to do an interim assessment of my progress to date. After just the first eight weeks of my training, I have lost 23 pounds of body fat while at the same time gaining 13 pounds of muscle, and I’ve decreased my pants size from a tight 44 to a loose 38! Without ‘dieting’ or starving myself! “Was it easy? No. There were no magic pills that worked while I was sleeping, or drinking shakes three times a day. Instead, it required that I really listen to Jeff and follow his advice, that I make a commitment to regular training no matter how bad a day I might have had or no matter how pushed I was for time, to follow the detailed but generous nutritional plan provided in my program, and taking the appropriate nutritional supplements that Jeff recommended at the right times. After only eight weeks and half way into my program, the results I’ve gotten are proof positive that Jeff’s program works! “After having my children and never working out or playing any sport my entire life, I didn’t know where to start to try to get into some kind of shape. That’s when my search for a personal trainer started and luckily, I found Jeff. What I like the most about working with Jeff is his subtle motivation. Jeff just doesn’t tell you to do something without an explanation on how it will benefit you, muscle or nutrition wise. “The other day I was getting ready for work and my husband said, “Wow, you are really slimming down.” My greatest compliment yet. I am starting to see that hour glass shape in my body and it never felt so good." “I started working with Jeff a little over a year ago in the fall of 2011. My goal at the time was to focus on feeling healthier and practicing lifestyle habits that would help me achieve this. I didn’t want to simply focus on weight loss – I had tried a dieting program before that just simply didn’t work and caused me to yo-yo with my weight. What I wanted to learn from Jeff was the tools that would allow me to maintain a lifetime of healthy habits. “I was astonished by how easily I could gain strength on Jeff’s program. After a little more patience (call it “enlightenment”), I made the diet changes necessary to feeling healthy, and cut the “bird food” out! I started to tone up, dropped a shirt and pants size, and started to feel energized at work. Now, I am excited to say that I have lost over 60 pounds while becoming one strong lady compared to how much I could lift before starting Jeff’s program. I am now working out with 445 pounds on leg press and bench pressing 50-pound dumbbells! “Even more exciting, I no longer have pain in my surgery knee. My New Year’s resolution is to focus on my cardio, now that I have strength and healthy eating as a platform to work from. Through the personal training and nutritional coaching of Santa Fe Way, I am confident I will reach my goals. I recommend Jeff’s program to anyone, at any age, that is serious about shaping up, and have recommended him to a friend who is now training with us! “My wife and I trained with Jeff while we lived in Santa Fe. He was an excellent motivator, and a friendly trainer who understood our limits, improved our strengths, and bettered our weaknesses. Jeff was professional, punctual and super congenial. All in all, a great experience -- we would go back to him if we lived in Santa Fe again! 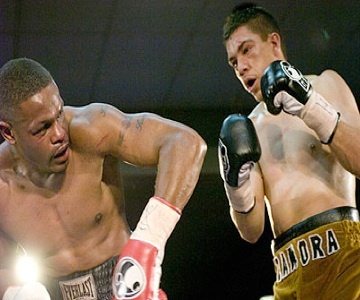 “In the sport of professional boxing, there are many myths when it comes to conditioning. Before I met Jeff Nailen, I was stuck in the monotony of the typical boxing workout. Running five miles before sunrise and a boxing workout in the evening was normal for me to be in condition for upcoming bouts. I had tried different workouts and diets but it was a lot of guesswork on how to put a good program together. “Working with Jeff has been very beneficial to my boxing career. We started working together in early 2008. Jeff took the guesswork out of how to eat for performance and he applied advanced training techniques such as plyometrics and interval training. Jeff played a very important part as I prepared for one of my biggest fights to date with the “Pride of Albuquerque” Ray Sanchez III. Not only did Jeff help maximize my strength, speed, and power, he also helped me make weight a lot easier with the specialized diet that he put together for me. “Jeff’s positive energy and outlook also helped me to want to do my best and his use of sports psychology helped me enter the ring with supreme confidence. In the Ray Sanchez fight in which I was the underdog, I scored a third-round TKO to score one of my biggest wins to date. “Zamora let the hands go and the first half-solid left hand that landed rocked Sanchez who turned his boxing plan into a survival game. In the last 15 seconds of the round, Sanchez draped himself around the stronger Zamora, barely able to stand. And when the bell rang, he was not only bleeding from a cut over his right eye, but looking dazed, as if he’d already been through a war...What had taken Julio Cesar Chavez, Jr. six rounds to accomplish, had been done with one good flurry of punches. The end was near. In complete control, Zamora reopened the cut with his first attack on a near-finished Sanchez, who, spent and spooked by Zamora’s strength and the blood seeping through his sliced brow, immediately sought to tie up, move and survive. it can help you lose weight too. “I’m a forty-year old woman who has gone from a 12/14-dress size to a size 4. Not only has my body been transformed, but my outlook as well. I give Jeff Nailen the highest recommendation for helping me achieve this for myself. “He was straight with me on what I needed to eat, and the amount of exercise that would be required to see the results that I wanted. Also, his unique weight-training regimen made all of the difference in the world. Before working with Jeff, I had been stuck in a plateau for months. I had become so frustrated with my progress that I was thinking about giving up on having a fit body. I was at the gym all of the time, but I wasn’t seeing any change in my body. “After the first couple of weeks of training with Jeff I started seeing changes. I was firmer here, stronger there. After two months, I almost didn’t recognize myself! I was at work one day when I realized my pants didn’t fit anymore. Now shopping is much more fun. I can buy clothes that I like rather than clothes that will cover me up. The best part of this journey is how better I feel. I truly believe that you can achieve the results that I have had the right way, without starving and diet pills. “Submitted by Christopher Ihlefeld, November 26, 2012. I write this testimonial after eight months of training with Jeff Nailen. During our time together the results achieved have been nothing short of remarkable. When I started working with Jeff I weighed 225 lbs. Today I weigh 190 lbs, reflecting 35 pounds of weight loss. What’s compelling is that I lost that weight while increasing muscle mass, so I’ve likely lost somewhere between 40 and 45 lbs of body fat. “Jeff is a thinking man’s trainer. He is very current on the latest research on exercise and nutrition, and he brings his own insight from nearly twenty years of training experience. He offers an individualized, well thought, integrative approach to his training. Jeff’s rates are also competitive. If he charges a premium above other trainers it’s because he should. “Jeff went to grad school at St. John’s College, NM. If you know any “Johnnies,” most of them are pretty smart, inquisitive, analytical types who are trained to think outside the box. Jeff fits that mold. I was never, ever bored working with him. “Before I started working with Jeff I was pre-diabetic, clinically obese, and hypertensive. My cholesterol and triglyceride levels were off the chart. I was a heart attack or stroke patient waiting to happen. I was also dealing with issues related to stress and anxiety. All of these conditions, to date, have been remediated. This was accomplished without the use of drugs, dangerous chemicals or hormones of any sort. “When I began addressing health problems a year ago I enlisted the support of two primary care physicians and seven specialists. I spent Lord knows how many thousands of dollars in “doctors” who were, very nearly, useless. Without question, the smartest thing I did to address my health issues was to hire Jeff. “I had to do the work myself, but Jeff was there the whole way and he was the architect of my fitness/nutrition recovery regimen. We met three days a week and our training sessions were short, fairly intense, and incredibly efficient. Jeff has a good natured quality. He uses positive reinforcement and is a consummate professional. “Jeff is an inspiring example of someone doing exactly what they were meant to do on this earth, helping people in a meaningful way. It won’t take long for anyone to realize how passionate Jeff is about his work. I have worked with and known a number of trainers in my life. I am a former collegiate athlete, and I’ve worked with other professionals in his field. Jeff is by far the best fitness trainer I’ve ever known. “As of today and after eight months of training with Jeff, my level of fitness is very near where it was when I was a college athlete. I’m more fit today that I was when I met my wife, and when I started my professional career 17 years ago. My weight had peaked at 228. I decided to do something, but just couldn't get myself motivated. I hired Jeff because having the responsibility of meeting someone on a regular basis was the only thing that would make me work out. It was difficult at first, always coming up with an excuse to cancel. Jeff would talk me through the excuse, and it would break down to finally going. I ALWAYS felt better after just doing it. “The amount of work that Jeff put in to personalizing my program and diet shows. His diet is not a typical diet. There's a list of foods that are specific to your metabolism, that are fresh and healthy, that you can eat as much as you will. They are foods that give you energy and that you can process more efficiently. Jeff always asks “How have you been eating?”, so he can check up on your progress. He's also very good at making healthy foods sound delicious... just ask him about HoneyCrisp apples! “Not only did working with Jeff help me lose weight – I’ve lost 44 pounds so far – and get toned and strong, but it helped immensely with my surgery. Six years ago I had ACL knee surgery and I was overweight and out of shape. A year after that surgery, my knee was still not back to normal and my leg would swell on occasion. The total recovery time was more than a year. “This past spring I had to get the ACL on the other knee fixed. A month and a half before the surgery I kept to the foods that Jeff recommended and worked out on schedule. I felt so strong and slimmer when I had the operation. I attribute being able to kneel down and fully flex that knee within two months to having worked out with Jeff, before and after the surgery. I couldn't afford the physical therapy from the doctor, so I just stopped going. Jeff and I took it very slowly at first, but then in no time I got stronger. Six months later I keep forgetting I even had knee surgery! “What a pleasure it is to work with Jeff. He is positive and friendly and never makes you feel bad if you fall short of your 'duties'. You can talk to him about anything, and I have! From how you feel emotionally and how it affects your motivation, to the state of American politics! When you talk about seemingly mundane things in your life to someone who is genuinely concerned about you, you get an objective outlook on how those things may be affecting your energy and health. And Jeff's sense of humor always makes the workouts fun. “His workouts are streamlined and efficient. Get used to not having to count how may repetitions you do. Jeff's keeping track of what weights you're using and how well you're using them. All you have to do is the best you can, and he'll measure your progress. He obviously loves his work and is constantly keeping up with the latest research and products and isn't afraid to change something for the better, like multi-vitamin/mineral recommendations. Also, if you really hate a specific exercise or it isn't comfortable, he'll suggest something else or work around it. “My journey with Jeff and learning about fitness, health and nutrition has been a wonderful and valuable life experience. My journey began over a year ago when visiting my medical masseuse, who is also an instructor and an expert in the field, took my blood pressure and it was not where I needed it to be! I had been neglecting my health, or putting it on hold, unfortunately, as I was focused on my career and academic goals along with not eating properly or working out properly. (Jeff would later share with me that we need to continue working out and eating well especially when work and class schedules get crazy as it helps with stress, and we need to make time for ourselves). That was my wake-up call! I had to do something to lose weight! “Luckily, I saw Jeff's website as I was brainstorming about what to do as I was anxious about my situation. I was so excited to begin my workout program with Jeff and to this day feel excited about working out with Jeff! I’ve lost 25 pounds and 7 inches off my waist with his diet and working out 3 times a week at the gym along with a weekly walking program and have worked to maintain the weight loss this year. This past year I have also participated in three 5Ks because Jeff inspired me to do this as part of my program and I have enjoyed getting involved in the events as well. “Jeff has also shared his knowledge with me on how to look and feel younger which I really appreciate! I have a new attitude about my health and I continue to work on my goals. Jeff is an exceptional personal trainer who is positive, fun, creative, patient, kind and is very inspiring and shares ideas with me about fitness and nutrition on my journey to health, happiness and well-being. Now, in my mid-forties, I am also stronger and have more flexibility from the 30 minute workout sessions I've attended this year including aerobic workouts during the week. Jeff is a very fun and positive person as well as a great trainer who inspires me to do my best. I enjoy working out and learning about fitness and taking care of myself and am moving forward with my health and fitness goals so I can lose the next 25 pounds and keep it off this year! “To refer to Jeff Nailen simply as a personal trainer is a gross understatement. Jeff and his comprehensive program are incredible and far surpass any diet or fitness program I am aware of and really cannot be compared. Jeff’s immense knowledge of nutrition, physical fitness, and mental and emotional health is amazing. His holistic approach brings results that you can literally see from workout to workout. “Within just a few weeks of working with Jeff the compliments began. My husband often comments on how good I look and how fast the change has been and continues to be. My children and grand children are so proud of my hard work and they too are amazed at the changes. My 8 year old granddaughter commented, “Wow, Nana, you are looking good!” My strength, flexibility, stamina and sense of well-being are greatly enhanced. There is so much more happening than just the numbers on the scale going down! “I work in a challenging and often stressful job. There was a time this fall when I was working several weeks straight, often into the night without time off. Before working with Jeff, after such an intense working period I would be totally exhausted both physically and mentally. This time there was a significant and very noticeable change in my physical stamina and mental clarity. “Jeff Nailen is a very special person, he is committed to helping you set and achieve your fitness goals. He gives his full attention to you as an individual. His optimism, steady and positive encouragement, and sense that whatever goals you set are attainable is contagious. “In working with him for just 6 months so far, already I am doing things I thought would not be possible. There is no magic or hocus pocus with Jeff’s program, it is hard work, but it is a lot of fun and the sense of accomplishment and the results are very real. The frequent compliments from others are also a great motivator. I have not had this much energy or felt this good in years! “I am 86 years of age and just glad I’ve survived without any major health impairment. My husband has had Alzheimer's for the last 6-7 years; adjusting to living alone and still being responsible for his care has been very stressful. 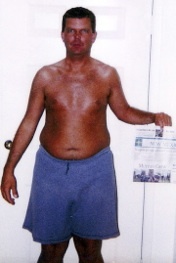 “I have been training with Jeff for five years now and I can testify that: my stress has been reduced, I have markedly reduced the fat percentage of my overall weight – my body fat has gone down from 46% to 26%, I have lost 10% of my weight, I have tripled my strength, my doctor is pleased with my improved health status, and the training sessions three times a week are a pleasure. “Jeff Nailen’s program has improved my personal well-being. Before I met Jeff I weighed 310 pounds. Presently I weigh 235 pounds. 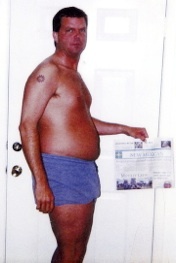 I have lost 75 pounds on Jeff’s program. “The program is comprehensive. His program is not a gimmick. The program is tailored for each individual. Jeff has spent years in the fields of fitness and diet. “Jeff’s individualized approach takes into account your medical history, your current fitness, and your own goals before coming to a fitness strategy tailored for you. Jeff’s plan will give you a no-nonsense approach to reaching your goals and he provides you the resources to achieve your goals. “Anyone with an ounce of sense should look askance at promises of physical and psychological transformation. And no one was more suspicious than ourselves. However, against our better judgement, we fell in with Jeff Nailen’s program and have been more than amply rewarded for our recklessness. “The fitness program that he offers is deeply researched and attentively delivered. Everything he promised has been achieved not only in terms of sustained weight loss (55 pounds) and muscular development but also in attitude improvement and self-discipline. This is attributable to two factors; the intellectual persuasiveness of his program and the cheerfully encouraging rigor with which he applies it to each client’s particular needs and physical type. “When I met Jeff Nailen I was seeking a healthy, sustainable way to obtain and maintain fitness. I had explored many weight loss options in the Santa Fe area and found that many of them were merely short-term solutions. Jeff impressed me with his knowledge of the fitness and weight loss literature, in addition to his enthusiasm. His thorough website is an excellent indicator of the well-rounded nature of his program as a whole. “Jeff is a determined, goal oriented, and optimistic person. Each of these qualities makes him a superb personal trainer. His determination is integral to attaining one’s goals. When the going gets tough and motivation wanes, Jeff’s determination alone keeps his clients going. He patiently guides one to meet and exceed one’s goals, especially in terms of strength. When Jeff sets a goal he has every intention of obtaining it and will go to great lengths to carry through with it. “By simply reminding his clients of the importance of setting reasonable and yet challenging goals he imparts a lesson that is useful in all of life. He then supports his clients in reaching each of the goals they set at the commencement of the program. Finally, Jeff’s optimism continually amazes me. He chooses to believe in only the best case scenario and this choice propels himself and his clients to unimagined positive achievements. These three characteristics ensure Jeff’s success as a trainer and therefore the success of his clients. “In terms of weight loss, while helping me to greatly improve my muscle tone in order to burn more calories, and generally to feel more graceful, he gave me a wonderful book in addition to my personalized program. This book is a source that I may never have found or that may have taken me years to find. It does an uncannily effective job at breaking down the causes of weight problems. It not only helps one become comfortable with eating, but also improves one’s outlook on life. That is a lot to say of one book, but it has proved true for me and for others to whom I have recommended it. “Jeff is a successful, ambitious person and therefore he attracts successful, ambitious clients. I was continually inspired by the incredible tales of motivation and achievements of his clients – and I respected the anonymity he maintained in relation to other clients’ identities. "Jeff Nailen is passionate about what he does. He is committed to giving his clients the benefit of his comprehensive knowledge of diet and fitness. "I have been a client of Jeff's twice. The first time was when I was newly diagnosed with type II diabetes. Jeff's enthusiasm and encouragement is contagious. I worked hard and lost 50 pounds and was in the best shape ever. Unfortunately, I stopped and slid down that slippery slope and gained most of the weight back and lost a lot of my strength. I landed in the hospital emergency room with very high blood sugar and elevated blood pressure. Heeding that wake-up call I am now back on track with Jeff and intend to stay there. "Since resuming Jeff's program my blood sugar is steadily getting better, I've lost 5 inches off my waist, an inch off my arms and legs, 12 pounds of weight, I'm regaining my strength and stamina, regaining my energy levels and confidence, buying smaller clothes, and other people are noticing as well. "Jeff knows how to motivate without being abrasive. His knowledge of how the body acts and reacts to exercise and the food we put into our bodies is extensive. He knows what works and what doesn't for each individual by obtaining an all encompassing health history at the beginning. "The most important lesson I have realized from working with Jeff is that this must be a top priority in my life if I want to have a healthy life." “I had tried all the other approaches in the past, including Weight Watchers, Jenny Craig, etc. without success. My experiences with these programs were very negative and ultimately contributed to further weight gains. Not only were they too basic and not right for me, but when they were not successful, and I started asking the people running these programs why they were not working, they immediately got defensive and made me feel that it was my fault, that if I were only following their program correctly it would be successful, which triggered feelings of failure, guilt, and hopelessness, followed by comfort eating binges and further weight gain. I got the distinct feeling that they were only interested in making money and did not really care about helping me. “In June 2000 I began working with Jeff in the hope that the downward spiral in my health could be stopped. In developing my goals I sought to reverse my recent massive weight gain, build my strength, and eliminate chronic illnesses due to the excess weight. As someone who has earned a Masters’ degree, I can say that Jeff Nailen’s work is at the doctoral level and is of doctoral quality. “Jeff’s approach is also very positive and supportive rather than punitive; when things aren’t going right and I get off track, he doesn’t make it worse by blaming me, but works with me in a supportive way to figure out what is best for me and he gets me back on track quickly. Jeff’s program is the only program I’ve tried that actually works. “The result is that my weight is steadily dropping. I have lost 25 pounds while gaining muscle and strength; my stamina is the greatest I have ever experienced; my doctor has halved my hypertension medication; and most remarkably, my adult-onset diabetes is now totally cured* and I am off my Metformin medication. These results have taken place in a positive, supportive environment that Jeff has helped me create for myself which I believe will keep me on track and lead to long-term success. “An unforeseen benefit of my partnership with Jeff is the reversal of how I view myself. Jeff was very confident that he could help me reach my goals and had faith in my ability to succeed, and this inspired my self-confidence and belief in myself that I could succeed. I now see myself as a happy and healthy woman who has hope that I will accomplish my goals with time. *Jeff’s note: Degenerative diseases, such as type II non-insulin dependent diabetes mellitus (NIDDM), commonly known as adult-onset or Type II diabetes (90% of diabetics are Type II diabetics), are not only preventable, but also reversible to a large degree. 80% of type II diabetics are overweight because glucose intolerance/insulin resistance both causes, and is caused by, overfatness in a bi-directional downward degenerative spiral. Whatever is degenerative is also regenerative along the same developmental pathways: it can be reversed. Type II diabetes is associated with aging, but is actually caused by several factors including a sedentary lifestyle, a high glycemic-index diet, nutritional deficiencies, being overweight, and there is also a recently discovered relationship between stress and the corresponding high cortisol levels caused by stress, and obesity, insulin resistance, as well as hypertension (these related degenerative conditions form a cluster commonly referred to as ‘Syndrome X’ or ‘Metabolic Syndrome’). The antidote to this is an upward regenerative spiral of renewal by means of a healthy lifestyle of fitness as Linda's experience exemplifies and inspires. “It is with great enthusiasm that I write of my experience with Jeff Nailen and the program he designed and implemented for me. I retired to Santa Fe at age 59 last September. One of my main goals was to lose weight, get my body in better shape, and become healthier in general. I had been discouraged for years because I had tried practically every program out there to help me accomplish this and had failed. “Those programs included Physician's Weight Loss Centers, Jenny Craig, Weight Watchers, OptiFast, Pritikin, Diet Center, and numerous others, including a local doctor known for his success with weight loss. In each case I would be put on a rather strict diet and would initially lose some weight only to gain it back. I was convinced that it was an insurmountable problem and that nothing would work for me. “Despite having had negative experiences with two personal trainers prior to my retirement, I interviewed a number of personal trainers in Santa Fe. I was not impressed with any of them until I talked to Jeff and he told me about his unique, comprehensive fitness program. I had no idea that Santa Fe had such a wonderful resource! I had always been frustrated by the confusing and often conflicting nutritional and exercise recommendations offered by trainers, nutritionists, and doctors. All my life I have been looking for a program that brings everything together into one package. That is exactly what Jeff’s program does. It includes diet, supplements, exercise, and much more, including advice on how to effect your hormones naturally and even time management for sticking to your program. “In brief, Jeff’s program WORKS!! 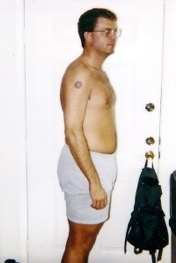 Since I started his program in December 1999 I have lost over 55 pounds of fat and gained significantly in muscle. 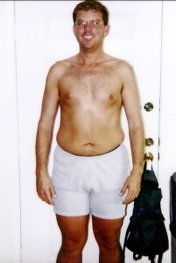 I've accomplished this by following Jeff's exercise plan tailored specifically to my needs, including personal training with Jeff three times a week, and eating good, nutritious, healthy meals without calorie-restriction, based on the highly individualized nutritional program he devised to meet my body's particular needs. “The concepts I've learned from Jeff have made an enormous difference in my life. My friends are constantly amazed at the phenomenally positive physical as well as psychological changes that have occurred in me. I feel and look better than I have in 35 years. The low self-esteem and occasional depression I had are gone and my outlook on life is brighter and beautiful once again. Jeff's program truly has reversed the clock in my case and I feel and look younger than I ever thought possible. “Jeff's comprehensive research into all aspects of health, fitness, nutrition, and related areas is unparalleled in my experience. His knowledge and understanding of how the human body works is so far superior to anything else out there that I consider any of the other programs or trainers a waste of time. “He doesn't promise anyone a rose garden. It requires hard work and persistence but he is there for his clients every step of the way and his program is 100% effective if followed as he sets it out. I couldn't be more pleased or gratified with his work and the tremendous help it continues to be to me. Jeff is absolutely wonderful to work with. For example, his keen observation and creative approach resulted in his devising specific exercises that are reversing years of muscular atrophy I was experiencing due to a former accident that my physical therapists were unable to treat and eventually gave up on. “An unexpected benefit of my personal training with Jeff has been a remarkable improvement in the quality of my voice. As a singer and voice coach, I had always been taught the importance of exercise for a strong voice and performance, but had frankly never taken it seriously. Though now retired, I am singing better than ever before, and recently auditioned successfully with the Santa Fe Opera, an opera known for hiring young singers. I would not have even auditioned for this role, much less obtained it, without the confidence gained by losing weight coupled with my vastly improved voice. “For excellence in a custom-tailored fitness program and personalized fitness training, we recommend Jeff Nailen. Both Dr. Martinez and Brenda Hart, RN, have used Jeff to design and provide personal training and coaching for a fitness program to improve muscle tone and help with our overall weight loss programs. “Two months ago, at my ideal weight, walking two plus miles daily, and doing Egoscue exercises 45 minutes a day, I felt I was in pretty good shape for an 84-year-old. For the last ten years my former employer had provided annual health reviews saying I would benefit from strength training: a recommendation I steadily ignored. But I’d had half a rib removed, and left shoulder and right wrist surgeries, and I knew I was getting more fragile. “Two months ago I took the plunge and started working with Jeff. I was shocked at how weak I really was. My hands were killing me. Jeff skillfully worked around and through my issues so now I can say I feel better than I did when I retired. My wife comments on the new color in my cheeks. I should have started with weights long ago: gentle cardiovascular and yoga-style exercises alone are not enough. “Just wanted to say thanks, I think your training and coaching program is great. I feel great and haven't been sick since I started your plan. This is the longest I've been healthy in the last 2 years – I attribute that to your eating and training plan. The training plan was a surprise to me – as you may recall I wasn't that interested in the training plans as I thought I knew what I was doing :-) But I see a difference not only in my muscle tone but in my strength and cardio fitness. The improvements in health and well being and the new muscle strength and cardio fitness really help to keep me motivated to keep up the program. This, I think, is key to life long success with diet and exercise. “I came to Jeff with a tall order. I wanted to get stronger but was not in a place where loosing weight (feeling attractive) was something I was ready to do. I in fact had some pretty intense resistance to it. Jeff has a unique combination of knowledge, a gentle and generous spirit with firm encouragement that pushes me to perform at my best. He does this without falling back on subtle but judgmental remarks or raging drill sergeant behaviors like some trainers do. His ego is safely and sturdily rooted in himself—not your looks so he has a deep well from which to draw encouragement and knowledge. “With Jeff we worked together to create a program that specifically addressed a program that worked best for me. We are currently focusing on bridging a positive relationship between me and my body. As i am sure many can relate to my body and i are at best disconnected and at worst at war with each other. “I met Jeff Nailen just over a year ago when he was training a client at Ft. Marcy. When I mentioned to Jeff that I was thinking of hiring a personal trainer, he suggested I take a look at his website for a full description of his approach to health training and physical fitness. After reviewing the site, I almost did not call him back because it seemed to me that his program was primarily aimed at weight loss...I have been slim all my life and at 6’2’ never weighed more than 185 pounds. I told Jeff that my goals were not weight loss but strength training, increasing flexibility and enjoying a greater energy level. “Without hesitating, Jeff said that all of these goals were consistent with the overall weight loss and health programs he offered. He encouraged me to take a metabolic test and other tests to determine what kind of diet would be most helpful in reaching my goals. Dubious though I was, I did the metabolic survey and Jeff prepared a highly individualized diet for me along with two to three training sessions a week aimed at reaching my personal goals. “About that 185 pounds: I might as well admit that what fat there was on my body circled my midsection like an inner tube. We started with body measurements to have something for comparing any progress I might make. In six weeks I had shed just over 15 pounds (right from the middle) and was beginning to see a real improvement in my strength and flexibility. My waist size dropped from 36 inches to 32 (and headed for 31!). “As if that were not encouraging enough, his customized diet made my whole digestive system feel so much better that I was able to go off the magic little purple pills (first Prilosec and then Nexium) which different doctors had prescribed for the past 25 years in order to control acid reflux. I dropped the Nexium four weeks after starting his diet, giving the remainder of my pills to a friend (who was not training with Jeff! ), and I have now gone a complete year without needing or taking any such medication. Jeff is an absolute threat to the prescription pharmaceutical industry! “Jeff and I now train twice a week. I am 77 and my overall physical health has never been better. And here’s the unadvertised benefit of working with Jeff: He is always extremely pleasant and thoughtfully considerate of his clients, focusing with laser attention on the client to make sure all exercises are performed correctly for maximum effect while making the training sessions more fun than actual work. There is no way to “sell” that kind of attention. It comes from the character of the trainer and Jeff has it in abundance. “Jeff has provided personal training to my elderly parents for over three years. Jeff is a patient, kind, and highly skilled personal trainer. Jeff cares about his clients and goes above and beyond the call of duty on their behalf. Jeff motivated a highly unmotivated client, my Father, to exercise. My Father had not exercised prior to Jeff’s intervention. Dad was 84 at the time. Jeff also worked with my Mother, who lives with Alzheimer’s and Parkinson’s diseases. “I am absolutely convinced that my Father has lived as long as he has because of Jeff’s personal training and motivational skills. When he started he could not stand up without assistance and couldn’t open jars. Now he is much more self-sufficient. “I was fortunate to be one of Jeff’s first clients in Santa Fe. I trained with Jeff for seven months, and I believe that hiring him as my personal trainer has been one of the smartest investments I have ever made. His talents to motivate and teach are just two of the many wonderful qualities Jeff possesses. "Jeff’s presentation was excellent. I have worked out off and on most of my adult life, even had a personal trainer or two along the way. Jeff has taught me more about maintaining my body in two hours than I had learned previously. He has shared the latest science and helped me develop a personal fitness routine that actually fits into my life rather that taking it over. “If I was as good at golf as he is at his profession I would be on the PGA Tour." “We were both very pleased with your recent presentation. We found it useful, interesting and informative. “I have known Jeff Nailen on a professional level for over 10 years. He is a registered independent personal trainer at our health club. Jeff always walks in with a giant smile and a heartfelt greeting. He is always a gentleman and always willing to lend a helping hand. Jeff is intelligent and knowledgeable. When it comes to computer technology, websites, or Internet questions, I go directly to Jeff for an answer. “Jeff’s generosity was signified by a gift he gave to one of our staff. Jeff had an old Subaru that conked out on him. Instead of repairing it he noticed that David, one of our young part time staff had a love for cars, so Jeff generously decided to gift the car over to David. I could see that this act of kindness and generosity brought Jeff joy and satisfaction not to mention the happiness it brought David. Get inspired – then be inspiring to others.